as promised here is the link to the Fourth of July parade. 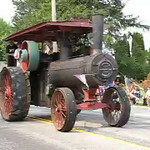 This is a steam engine that tootled its way on Hwy 27. Amazing to think that not so long ago we depended upon this type of power. Note the metal wheels. My neighbor said his dad used the metal wheels on his petroleum powered tractors in the spring time–so he could plow before everyone else==in the muddy fields. Spring in Wisconsin meant MUD, MUD, and more MUD. That neighbor also had lights on his tractor so he could plow at night. Making hay had to be done in the daytime as the dew would make the hay too wet to bale–it would spoil.